card in play, gain 3 magicka this turn. card in play, draw a card. 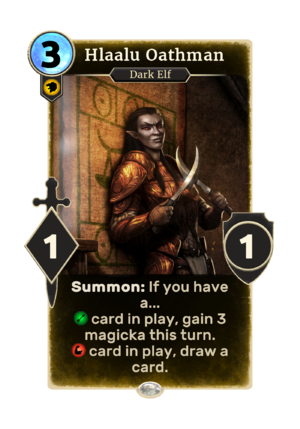 Hlaalu Oathman is a common Willpower creature card. It is part of the Houses of Morrowind expansion. "Just tell me who to stab." This page was last modified on 28 February 2019, at 00:01.